Maximize the effectiveness of your speeches with a conference podium from Hertz Furniture. During important presentations, a visually-appealing lectern will help keep your audience focused. Our models come in many different materials including acrylic and wood. What is the best podium microphone? We have lots of high-quality podiums with microphones. 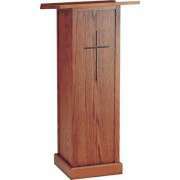 Whether you need a church pulpit, podium or multimedia lectern, we offer a number of great options. Many of our models come with a complimentary extended warranty, so you can enjoy years of worry-free use. How can I keep my notes from falling off of the podium? The basic lectern design includes a raised surface where one can place notes and other materials that are needed for the presentation. However, there are many available enhancements which facilitate a wider range of use. Podiums that are meant to be used with notes or books have an inclined reading surface with a bookstop which facilitates easy viewing and prevents materials from falling off. What kind of podium is flexible? 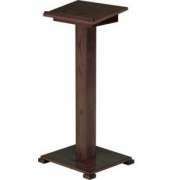 Adjustable-height podiums are ideal because they accommodate speakers of all sizes. They are convenient in any setting, but are particularly useful for a school where they might be used for student government campaign speeches or awards presentations. We also offer a number of mobile podiums. Casters make it easy to roll your lectern from place to place as needed without requiring too much physical strength or strain. For a very convenient option that can serve almost any purpose, try the height-adjusting portable podium from OSC. 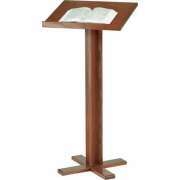 This lightweight lectern can be set up and whisked away in no time. It&apos;s compact size takes up very little space, so it is easy to store or keep on the side when not in use. What kind of lectern looks modern and professional? Clear acrylic podiums have a sleek modern appeal that breaks down the barriers between speaker and audience. Shatterproof acrylic doesn&apos;t block the speaker, but provides a comfortable reading surface. The contemporary design is perfect for a high-tech company or anyone who wants to stay on the cutting edge. How can I keep all of my multimedia equipment mobile? In the digital age, plain audio presentations just don&apos;t cut it all the time. Our selection of presentation AV carts and multimedia lecterns offers a number of different options which accommodate various electronics. Whether you need to hold a laptop, slide projector, document camera or all of the above, our audio-visual options have everything you need. Many include a convenient built-in powerstrip as well. For maximum convenience, choose a model which includes a locking cabinet, so electronics remain secure between presentations. If you prefer to use a desktop computer, you can purchase a computer cart which includes a CPU holder and pull-out keyboard tray. Any of these arrangements offers a great way to bring technology into the classroom. Are you looking for a podium that can reach thousands? You can get a podium with microphone and speakers so you don&apos;t have to worry about finding the appropriate equipment and hooking it up. The distinguished appearance of OSC sound lecterns is befitting important addresses and world-renowned orators. We even offer a model with an LCD screen on the front so you can display your company logo or photos and diagrams during speeches. If you don&apos;t need a full-size lectern but enjoy the comfort of a raised reading surface, try a tabletop podium. This convenient option offers the benefits of a comfortable reading surface without taking up very much room. 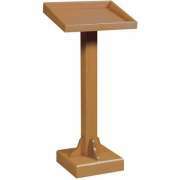 We even offer a tabletop lectern with a user-friendly built-in sound system. Lecturers spend hours preparing speeches and presentations, so they deserve to be framed by a lectern that exudes authority and professionalism. Make sure that your voice is heard and your message is clear with an attractive professional podium from Hertz Furniture. Or selection includes many attractive models that are great for schools, churches, companies and anywhere else a podium is needed.